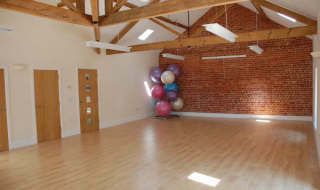 Chrissie currently teaches two yoga classes each week in the custom-built, under-floor heated studio at the Ocean Physio and Rehab Clinic in Woodbury near Exeter. All classes are suitable for beginners and those at intermediate level, combining the traditional Hatha style with elements of the more therapeutic Yin and restorative yoga. Classes are kept intentionally small (with no more than 10 students) to ensure maximum benefit. The new spring term starts on Wednesday 20th January 2016. Prices for classes are £8 for a 60-minute class as a ‘drop in’ or £42 for a 6-week block. Private tuition for individuals or small groups is also available, either at the Woodbury studio or in your own home (where appropriate). After several years of personal practice, Chrissie trained as a yoga teacher in 2010. She is a Registered Yoga Teacher, Mindfulness Coach and member of the Independent Yoga Network. Chrissie is deeply interested in yoga philosophy as much as the physical practice and has broadened her knowledge by significant further study, taking regular classes and attending various yoga courses, workshops and retreats in Mexico, Morocco, Malta, the U.S. and the UK. She continues to broaden her interest in sport-specific yoga and the benefit that yoga brings to those competing at all levels. We’d love to see you at one of our Integrated Wellbeing 2015 workshops, the majority of which are held in venues across Devon. Our workshops are run by Chrissie herself (unless otherwise stated) and cover a specific issue within a wide range of Wellbeing topics. Learn powerful meditation techniques for living every day in the here and now at an “Introduction to Mindfulness” workshop; explore your relationship with food and learn to make compassionate choices for life at a “Let Food Be Thy Medicine” workshop; or begin to conquer the cycle of negative thoughts and limiting self-beliefs with specific movement and mindfulness techniques at one of our “Control-Alt-Delete” sessions. Check out the About page here on the site to find out more about Chrissie’s experience and approach to Wellbeing coaching, and browse through the free resources in our Mind, Body and Food Matters sections to see what’s currently getting her excited. Our workshops are limited to small numbers so that everyone has a chance to ask questions and maximise their benefit. Be sure to sign up for our free mail-out so that you’re one of the first to know when new dates are announced. Once the next set of workshops are announced, reserve your place with our simple and secure click-to-pay process. Alternatively, if you’re an employer or member of a group or society wanting Chrissie to deliver an in-house seminar or workshop, please email info@integratedwellbeing.co.uk with your enquiry and we’ll get straight back to you.